"Where Can I Get That?" Wife. Mom. Career woman. Nail Polish Junkie. Site and content belongs to Dee. Copyright 2010. All Rights Reserved. Powered by Blogger. Sharing my passion for nail polish expressionism! :) And some other interests sprinkled here and there. A few weeks back I finally was able to get a couple of Nubar polishes I had on my wish list for the longest time. Nubar was having a one-day (I think??) 20% off sale on their website, so I had to seize the moment. Like many polish afficionadas out there, I had to get Peacock Feathers. I've never owned any duochrome polishes previously, and heard Nubar's are the best. Peacock Feathers does not disappoint in the least. Capturing it's beauty was very difficult. If you look at it straight on, it looks deep indigo blue/purple. Shift your fingers slightly and you get emerald green, and at times you may catch glimpses of gold. You can definitely see the different shades better in the bottle than on my nails. As far as the application, I used 3 coats and 2 coats of ridgefilling base coat, since on previous occasion, my other Nubar polish was sheer enough to have VNL. I don't think it was necessary for Peacock Feathers since the color is darker than the one I was using before, but I just wanted peace of mind. The application was pretty good. I can't remember how many days I wore this since it was a while ago (plus my memory isn't as great as it used to be...sleep deprivation and all - those with children know what I mean...hehehehe). I just got a new camera so hopefully I'll be able to post better swatch pics. Oh Kylie2....I really wanted to like you, but unfortunately, you were such a disappointment!! You deceived me!! You pretended to be a color that you are not!!! 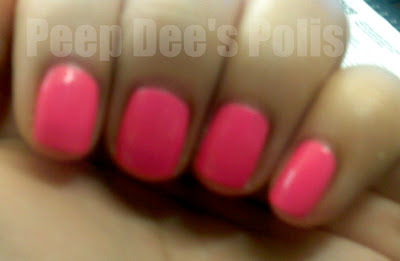 Woodstock is another polish from Urban Decay's Summer of Love Mini Polish Collection. I love this polish. I don't consider myself to be a neon pink kind of gal, but after I finished applying the first coat, my reaction was, "WOW". I'm bummed that I still couldn't capture it's "neon-ness". I'm not sure if it's the lighting (natural light but indoors) or something else, but in reality, the color on my nails is the same as in the bottle. Seriously this color is NEON, like they liquified a fluorescent pink highlighter and bottled it, or "will-cause-you-to-go-blind-if-you-stare-directly-at-it-too-long" type of neon!!! LOL Definitely an attention grabbing polish. Got a lot of compliments for this one. It's pretty opaque. I used three coats but maybe I could have gotten by with just two coats?? (can't really remember now). If you haven't gotten your hands on this collection yet, you can purchase it at any Urban Decay store/counter or on Urban Decay's website http://www.urbandecay.com/categories/SummerOfLoveNailKit.cfm. I purchased mine at the Urban Decay counter at Macy's.